Washroom Services Dilemma: Hand dryers or hand towels? As a result, they have spent an odd amount of time testing hand dryers against the basic paper towel; from hot air to cold air up to even the latest Dyson technology. Safe to say, their rich data confused us to the point where drying your hands in a public bathroom became a chore in itself and we’d all just hold it in until in the safety of our own homes. The good news is, we can now step back into a washroom without being scared for our lives because the NHS has put the argument to rest once and for all. It was suggested that hand dryers are deadly germ machines, that had the potential to spread 200% more dirty microbes in the air than paper towels. Although, many protest there is no real research to support this statement. It has even been postulated that hand towels companies were, in fact, on the biggest marketing strategy of all time: They had been commissioning the anti-hand dryers research to win over the market. The argument for hand dryers is simple. They are less expensive to run, produce less mess and bring the convenience of modern technology into public bathrooms. Along with lower maintenance costs and appealing washroom looks hand dryers are a no brainer. Also, for washrooms where space is scarce, hand dryers replace the need for a waste bin, freeing up floor space. In busy washrooms where people are in a hurry, hand towels might seem more attractive, simply because they are faster. The average hand dryer takes approximately 20 seconds to dry your hands, whilst using a paper towel is almost instant. Due to new technologies and revolutionary design, the eco hand dryers are on the rise. 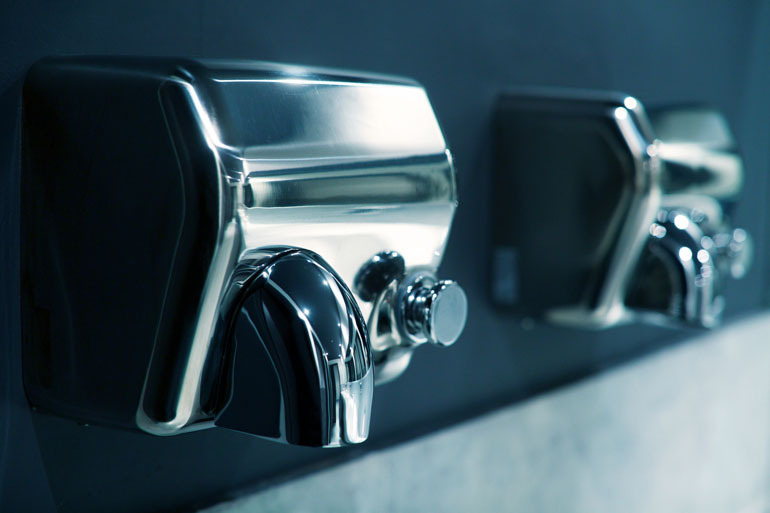 While it’s almost impossible to measure the exact impact on the environment, however, studies have shown that both hand dryers and towels are supported by eco standards. When it comes to washroom services, are you a dryer or a towel(er)? Looks like people are leaning more towards hand towels, but not for the reason you might think. Paper towels are still the best selling and the reason is simple and non-scientific. The NHS has responded to a Daily Mail’s article from 2013 with the correct answer, which is basically just common sense. “There is little evidence that they are any worse than hand towels, other than the extra time spent drying your hands.” – find the whole article on the NHS page. So, whatever washroom service you use to dry your hands, make sure you dry, dry and dry some more.